Pixel XL 2 to have Always-On ambient display with squeezable sides? According to a report posted yesterday, the 2017 Pixel XL (or Pixel XL 2) will feature an ambient, Always-On display. With the latter, important information can be displayed on the screen, even if the device is locked and idle. Battery use is minimal, and users will be able toggle this feature on and off to their heart's content. Another previously rumored change would return the glass cover to the two-tone design on the back of the device. However, with the sequels, the glass would not cover the fingerprint scanner as it did with the original models. 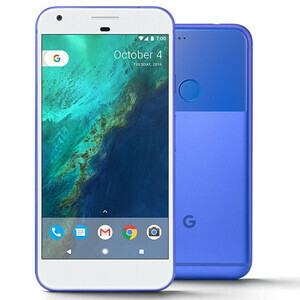 Additionally, it sounds as though the Pixel XL 2 will have a feature that activates certain functions and opens apps by squeezing the sides of the phone. This would be similar to the Edge Sense squeezable sides on the HTC U11. Considering that HTC built the original Pixel handsets and could manufacture the Pixel XL 2 or both 2017 Pixel units, this is not a wild pie-in-the-sky theory. With Edge Sense, HTC U11 users' decide what actions take place with both a long squeeze and a short squeeze of the handset's sides. Google might be planning on adding additional capabilities such as allowing the user to stop the ringing on incoming calls with a quick squeeze. There is talk about the use of a darker default theme for the Pixel sequels. Such a theme was seen in early versions of the Android O Developer preview. And Google might introduce a new system font with the 2017 Pixel models. The Pixel 2 and Pixel XL 2 are both expected to be unveiled during the first week of October. Let me guess... to avoid button broken? I think the squeezable sides thingy is already quite useful with HTC's implementation. Or both like in the case of the Nexus 5X and 6P where different manufacturers made it. Hopefully this time we have 2 different premium/high end devices by two different OEMs, would make things so much more interesting. Then hopefully they just stock enough phones to actually make a dent in the market. The Pixel brand is widely known enough now to be worth pumping out in large quantities. Mr. Whipple didn't want us squeezing the Charmin. Why are we trying to squeeze our cell phones? Considering how you see these things SQUEEZED into the back and front pockets of kids wearing those crazy skinny jeans, how many things will get launched, by just being in their pockets?